Surfacing in 1947 with interests in real estate, followed by stock-broking, late Haji Abdul Karim Dhedhi (may he rest in peace) laid the foundations of the legacy that has come to be the resilient AKD Group – one of the premier business enterprises of Pakistan. 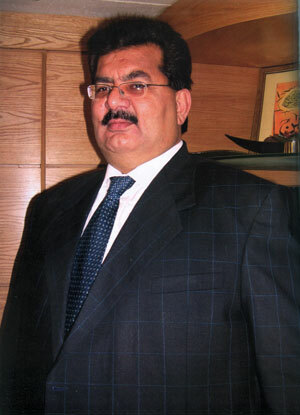 Mr. Aqeel Karim Dhedhi, son of (late) Haji Abdul Karim Dhedhi, continues the legacy as the chairman of the group. With his transformational entrepreneurial vision, the AKD Group has evolved into a vibrant, impregnable set of business enterprises operating in key sectors of Pakistan’s economy, including financial services, telecom, infrastructure, manufacturing and natural resources. Transforming the theoretical ‘first mover advantage’ into a pragmatic reality, Mr. Dhedhi’s awe-inspiring philosophy is exemplified in many of his initiatives. AKD Securities was the first to launch a state-of-the-art Online Stock Trading service in Pakistan and remains the leader in this arena today. Hovering majestically 30 storey (Tower A – 17180 sq ft) and 22 storey (Tower B – 17810 sq ft) above the glistening skyline, The Arkadians is your royal abode where dreams cascade into reality. The First Phase of The Arkadians inculdes the residential community. Presenting a unique blend of space, style and luxury, the premium residences designed in detail by The Architects – are available in a choice of several exquisite plans, each carrying exclusive and meticulous attention to detail in the form of 2-bedroom suites, 3-bedroom suites, 3-bedroom Centre, 3-bedroom Large, 4-bedroom duplexes and the regal Penthouses. The Arkadians is irrefutably Pakistan’s most prestigious address which offers its limited number of privileged businesses and homeowners luxury and personalized services. This is where the collision of crucial forces takes place. This is where your ‘home’ meets the market. Aspiring to be the business and commercial centerpiece of Karachi, The Arkadians is also home to 6 purpose-built top-of-the-line office enclaves. Where luxury residential living intercepts the high-end Business Bay, enter the ‘gated community’ which has no peer and stands impregnable in all its glory. Address: Golf Club Way, D.H.A. Phase 8 Zone B Phase 8 Defence Housing Authority.